Postcard courtesy of Sherry Virts This postcard shows the building that now houses Bundy Baking Solutions on East Water Street. The 23rd Champaign County Preservation Alliance Historic Home and Garden Tour is almost here. It will start at 11 a.m. on Saturday, June 27, and run until 5 p.m. each day, closing on Sunday, June 28. The home and garden owners are feverishly working at last minute details to welcome you. This year, as for the last 23 years, we have had the full support of our communities. Both public and private groups and local businesses have helped put on this community event. We especially appreciate the Urbana Daily Citizen for again publishing a special tabloid June 24 about the histories of our tour stops with many details. Of course there are always those unexpected events that need attention. One highlight of our recent tours has been the raffle baskets loaded with local products donated by county businesses. Committee member Londa Schwierking always so capably handled this project and was working on it when she was taken from our world. This year the basket raffle will be in memory of Londa, our good friend and hard-working member. The baskets will be on display at the Preservation Alliance Garden Shoppe at 206 Scioto St. This location is one of our tour stops, a building under renovation called The Carter House. This brick structure eventually will house two businesses along Scioto Street and living quarters elsewhere in the building. Rich Colvin will have his Scioto House Antiques open later this summer in the side where the Garden Shoppe will be set up for the tour. We are fortunate this year to have two corporate benefactors in addition to our 11 site sponsors. The Peoples Savings Bank of Monument Square, Urbana, Ohio continues to faithfully support join our efforts of preservation with their support and has been joined this year for the first time by Bundy Baking Solutions. They are a family-owned company founded by Russell T. and Elizabeth Bundy in 1967. Bundy’s is headquartered in Urbana at 417 E. Water St. It is recognized around the world as a leader in the baking equipment industry, yet many people in Urbana know little about the company, except perhaps for the handsome old building it occupies, guarded by two large lions at the gates. The company includes several manufacturing branches: American Pan, Chicago Metallic, DuraShield®, Pan Glo®, RTB and Shaffer. Champaign County is blessed to have been chosen by the company’s founder, Russell T. Bundy, as the location for his own private Bundy Baking Museum. One of Russ’s long-time passions has been to collect the memorabilia and historical artifacts of the baking industry. He has created a remarkable museum dedicated to his collection, which is housed in Urbana, Ohio. The Bundy Baking Museum is indeed a fitting tribute to the industry that has fueled Russell T. Bundy’s entrepreneurial passion for more than 40 years. Over the years he has accumulated a vast collection of baking memorabilia and chose the Urbana site as a fitting location to store and display them properly. For all of his accomplishments in the baking industry he was inducted into the The Bakery Hall of Fame in 2006, according to their website. I personally feel a connection to this building site, having had my first “grownup” secretarial job here, back in 1964, when the building housed The Urbana Tool and Die Company. In addition to my first job experience, later, I was privileged to have been invited as a math teacher in the Urbana School System to complete an inservice day at The Bundy Company back in the 1990’s and received a tour of the, then little-known, private museum and company operation. As a new benefactor of our Historic Home and Garden Tour, the community needs to know something about Bundy Baking Solutions. It is headquartered in a well-preserved old manufacturing building dating back 138 years. 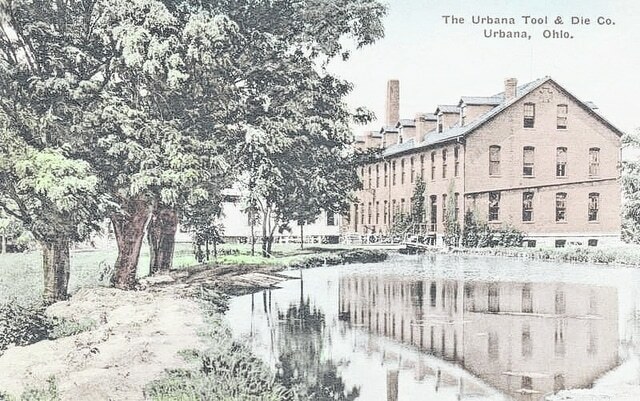 According to Beer’s Champaign County History of 1881 “On the southeastern portion of the city, the ‘woolen factory’ always catches the eye of the stranger.” As early as 1814, John Reynolds bought this land from brothers, John and William Ward Jr. (sons of founder Col. William Ward) and together with Elisha C. Berry built a mill for making flour, which was then enlarged and changed into a carding and woolen factory. This business passed through a number of hands. As the property of Messrs. Henry Fox and Co, they turned out textiles which competed with the finest mills of the country. They entered competition at the Centennial Exposition at Philadelphia in 1876 and won the prize medal. This handsome factory building is considered one of the permanent fixtures of the city. The first building, a frame structure, was replaced by a brick structure in 1881, while the stone addition was added in 1883. In 1889 the stone addition was enlarged and the mill was overhauled and put in a good state of operation. Unfortunately by 1912, the business climate had changed, those with a passion for the textile business died and the mill closed. That same year James K. Cheetham Company established itself in this building to produce tools, dies and auto parts. George P. Stelzer was the last president and general manager. Until 1972 they produced steel and carbide lamination dies and special machinery. Our community is grateful to Russell T. Bundy for his innovative vision for the facilities of the old Urbana Tool and Die building and for his continued commitment to our community. Our community is rural and quite small in comparison to Mr. Bundy’s world-wide business interests, and yet he sees the value in locating here that we see in living here. How little we know sometimes about what we have in our own county. Bundy Baking Solutions headquartered in Urbana began elsewhere in 1964 when Mr. Bundy began selling used baking pans and equipment. Eventually he would incorporate equipment refurbishing into his line of services. By the early 1970’s, he created the industry’s first pan glazing company and in 1980 he started the American Pan Company, manufacturing bread, bun and specialty pans for the commercial baking industry. American Pan Company now distributed world-wide. Pan-Glo, the pan glazing division has 13 locations nationwide and in Mexico. There always seems to be more to learn about the rich history of life in Champaign County. Join us Saturday, June 27, and Sunday, June 28, from 11 a.m. to 5 p.m. for the 23rd Champaign County Preservation Alliance Historic Home and Garden Tour and find out about the community in which you live. For those non-Internet people who need to know where to buy presale tickets they are readily available at the following locations: in Urbana are Peoples Savings Bank, Bill’s Enchanted Florist & Gifts, Perpetual Savings Bank, Cupboard Distributing, Civista Champaign Bank, Champaign Chamber of Commerce, Security Bank, My Old Ohio House Antiques, Fruit Salad Antiques, The Boston, Ben & Me, Kaleidoscope, and Unique Boutiques; in St. Paris at Braden’s Cafe’ & Sweets; in Mechanicsburg presale tickets are at Security Bank, Hemisphere Coffee Roasters, Mechanicsburg Public Library, and Village Pharmacy; West Liberty locations are Marie’s Candy, Mad River Farm Market, and The Trumpet Vine. The price is $10 before the days of the tour and $12 on the Saturday and Sunday at any tour stop and on Market Street beside the Urbana Municipal/Police and Fire Station building. Free Shuttle Van service is available. Park and ride on us. Any questions, leave a message at 1-800-791-6010.